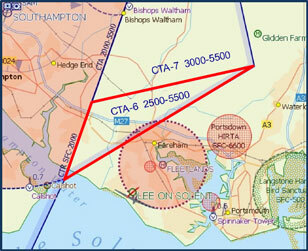 The CAA has approved the reclassification to Class G of the area of Solent CTA-6 below 3000ft, bringing it into line with CTA-7. The CAA has approved the FAS VFR Implementation Group’s proposals to disestablish a portion of controlled airspace within the Solent Control Area (CTA), in accordance with the CAA’s policy for the Release of Controlled and Segregated Airspace. The proposals, which will see the base level of CTA-6 raised to 3,000 feet above mean sea level thus releasing 500 feet to Class G airspace, will be implemented on 26th May 2016. All of the responses to the Solent CTA-6 ACP Consultation have now been analysed and addressed. The Release of Controlled and Segregated Airspace Change Proposal “Solent CTA-6: Reclassify to Class G below 3000ft” has been formally submitted to the CAA today, 21st September 2015. The General Aviation Alliance is sponsoring this airspace change proposal aimed at improving aircraft and airspace safety in the South of England. This is a lead item from the Future Airspace Strategy VFR Implementation Programme. This proposal would raise the base of Solent CTA-6 by 500ft to 3000ft amsl to match the base of CTA-7 on its northern boundary. This would improve safety by opening the narrow slot of Class G airspace above the Fleetlands ATZ and reducing the need for aircraft flying VFR to avoid the Class D by overflying Portsmouth.